A new Transparency Market Research report states the global hospital stretchers market was estimated at US$1.3 bn in 2012 and is anticipated to expand at a CAGR of 3.90% between 2013 and 2019, to reach an estimated value of US$1.7 bn by 2019. The title of the report is “Hospital Stretchers Market - Global Industry Analysis, Size, Share, Growth, Trends and Forecast, 2013 - 2019”. As per the report, the hospital stretchers market has been experiencing continuous growth and will maintain the same trend in the coming years. This growth in the market has been attributed to the rising average lifespan, ranging from 7 to 10 years, of these stretchers and the presence of refurbished equipment. In addition, the rise in demand for stretchers that are technically advanced, increasing surgical procedures, and the rising occurrence of chronic diseases are the prime factors predicted to stimulate the growth of the market. Furthermore, the increasing global geriatric population is also an important factor fuelling the demand for hospital stretchers owing to elderly people being more prone to numerous disorders that require hospital care. 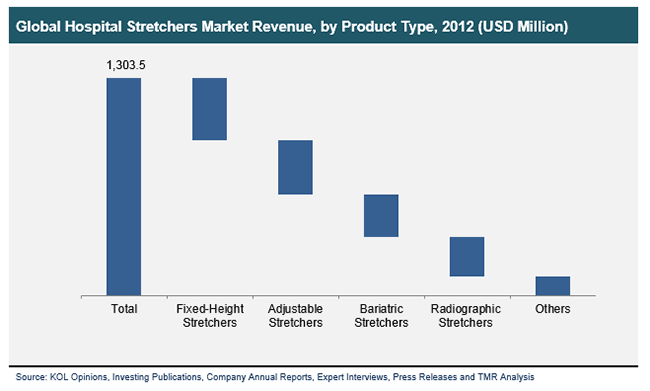 In the report, the hospital stretchers market is segmented on the basis of product types, applications, technology, and geography. In terms of product type, the market is segmented into adjustable, fixed height, radiographic, bariatric, and other types of stretchers. Amongst these, the bariatric stretchers segment is predicted to be the most swiftly developing segment in the forecast horizon, expanding at a 5.90% CAGR. The reason for the growth of this segment is the global rise in the obese population. Obese patients need to be carried to hospitals and healthcare centres with ease, leading to an increasing demand for bariatric stretchers owing to their ability of carrying very heavy weights. In the same way, the segment of adjustable stretchers is also expected to expand in the coming years due to rising demand for automated and technologically advanced hospital stretchers by super-specialty and multi-specialty hospitals. In terms of technology, the market is segmented into non-motorized and motorized stretchers. In terms of application, the market for hospital stretchers is segmented into emergency department, intra-hospital transport, radiology department, pediatric surgery department, and day care surgery department.In terms of geography, the market is segmented into Europe, Asia Pacific, North America, and Rest of the World (RoW). Amongst these, North America dominated the hospital stretchers market due to a lot of manufacturers being present in this region. The rise in the population suffering from chronic diseases and the region’s cutting-edge medical infrastructure are amongst the other prime factors boosting the hospitals stretchers market in this region. On the other hand, Asia Pacific emerged as the most favourable market in the forecast horizon owing to growth in medical tourism in countries such as Singapore, India, and others. Hill Rom Holdings, Inc., Gendron, Inc., Stryker, Hill Rom Holdings, Inc., Medline Medical Equipment, Inc., and Karismedica S.p.A are amongst the key players dominant in the market.